Oriental rug restoration is exactly as the phrase implies. It is a reconstruction of damaged or missing areas, utilizing the same materials and manner of construction as the original work. Re-wrapping edges, re-knapping of moth-eaten areas, and re-weaving of holes or tears are examples of restorative treatments. We have a very extensive stock of vegetable dyed and chromium dyed wools, so as to be able to match the original colors. 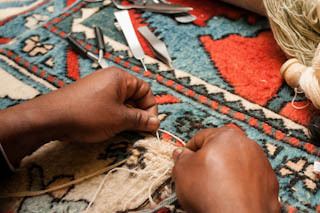 Becoming a lost art our two full time Oriental rug repairers are highly skilled and talented.